I stamped a Mendhi Medaillion with Aqua Mist ink on Aqua Mist paper just for a subtle background! Then I layered the leaves and rolled flowers on the stamped image! I added that to the textured card base with foam tape! I couldn't get the color of that darker violet to shoot right! It is a lot light IRL! Off to make dinner....and still not sure what I should make and its time to eat! What are you having tonight? *sigh* Beautiful card. Love the subtle medallion behind the flowers. Beautiful Laurie! Those rolled flowers are so pretty! We are having left overs from last night, spaghetti with homemade tomato sauce . Gorgeous! Loving that color combo. Your design is so pretty. So beautiful. Have you given directions for making those lovely flowers? I'd sure like to know how to make them. Very pretty, love the rolled flowers. And the mehndi medallion as the background, stunning. you're killin' me over here. could you please make even just one card that is NOT perfect? my self-esteem is suffering greatly. great card...those flowers are perfect! This is so pretty, Laurie! Great design! Beautifully done!! Super pretty card. I've been dying to try to make these flowers like you do - maybe tomorrow! Hope you figured dinner out - that sounds a lot like me lately - I'm thinking of what to have when it's time to eat!! What pretty rolled flowers, Laurie! I always love your cards, and this is an awesome CAS design. Thanks for joining us at colourQ this week! How do you make your rosettes? I absolutely love them!!! I kept looking at those colors and had no idea how to put them together. This is fabulous! You make it look so easy. Love the rolled flowers - and the way you used the color combo is absolutely stunning! (Thanks for stopping by my blog). Really beautiful card, Laurie! I love your flowers. Thanks for joining us at the ColourQ this week. We had simple green salad, mushroom and fake beef stroganoff over egg noodles and plum pie for dessert. Beautiful, Laurie! Your rolled flowers are absolutely perfect, and I just love the balanced composition. 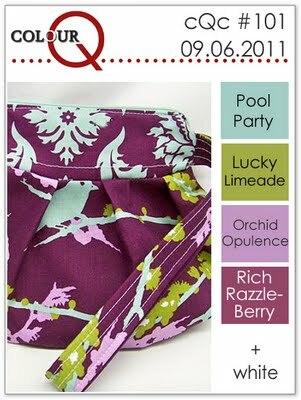 So glad you could play along with the ColourQ this week! Great card! I understand about your colors not photographing well - My Pool Party was 5 shades of blue off - no matter what I did! Thanks for playing along with us at ColourQ this week! Um........gorgeous as always!! Love the design of this card and the little peekaboo medallion stamped on that panel. Stunning Laurie!! Really gorgeous! WAY TO ROCK THE COLORS! 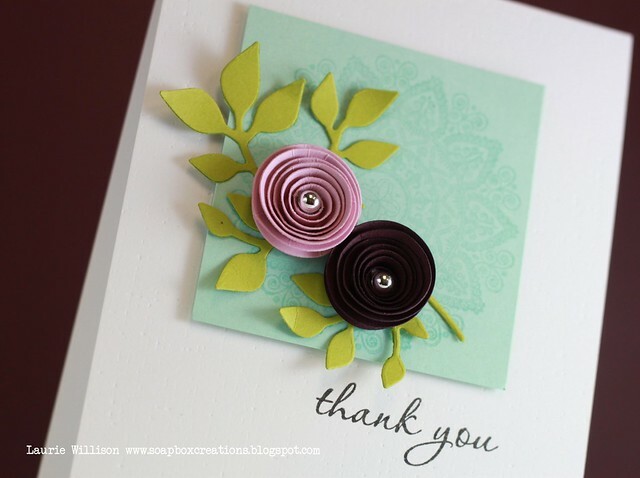 Just a simple, perfect card in every way~ CONGRATS - you're this week's colourQueen!!! 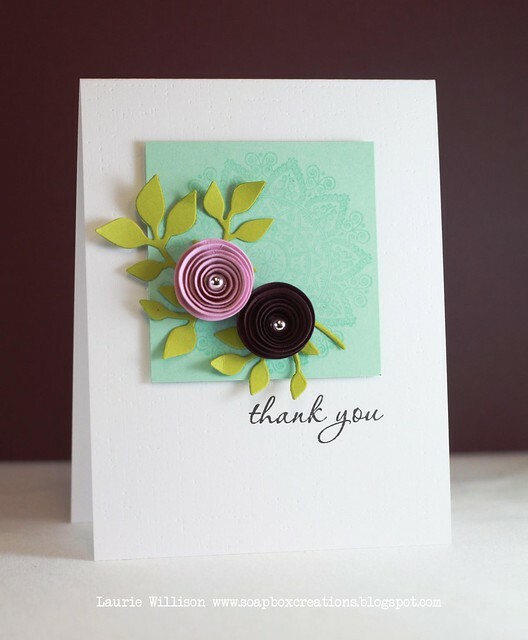 Thanks so much for entering this gorgeous card! Love this!! The colors and how you used them are gorgeous!! Have got to use my rolled flowers!! Very pretty! LOVE LOVE LOVE, this is so gorgeous Laurie! Wonderful job! congratulations! your card is beautiful! Yay for Laurie! Huge congrats on your well-deserved win! I'm so happy for you. You knew I'd like this card right? hehe Love the color and those rolled flowers. Beautiful Laurie!